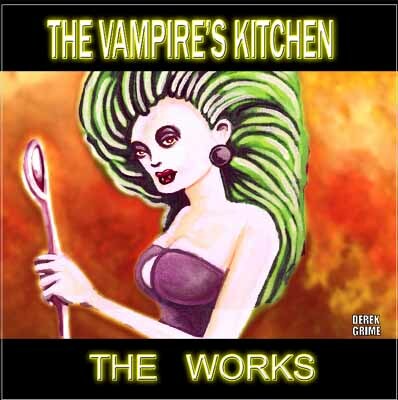 Here's a new remixed Cd of the 2 rare original cassettes releases by the filk / folk group Vampire's Kitchen. This is the complete works from the band, of which Stephanie Bedwell-Grime was a vocalist, guitarist and song writer, along with talented singer/songwriter/musicians Evelyn Baker, Edgar Lebel and Anne Ostrom. Many of these themes were later used in Stephanie's novels. This CD compiles the two original cassettes, The Vampires Kitchen and the follow-up The Return of Count Spatula. This CD includes 2 never before released live tracks and new cover art by Derek Grime. This is the ultimate and complete compilation from the band. Tracks include The Bleeding Sun, Slow Poison, He's So Cold, The Vampire's Kitchen, Snow Queen, Star Child, Star Gazing, After the Filk, Threatening Sky, Beezlebub, Nomad, Is Anybody Listening, Silver, Avalon, Bloodlust, Pteradactyls, I Must Leave You and two live tracks. At the moment, this Cd is available nowhere else, except this page. Price is $20 USD, which includes surface shipping to the USA or Canada. This is a homebrew CDR and may not play on older CD players. Email us if you are interested in getting a copy!